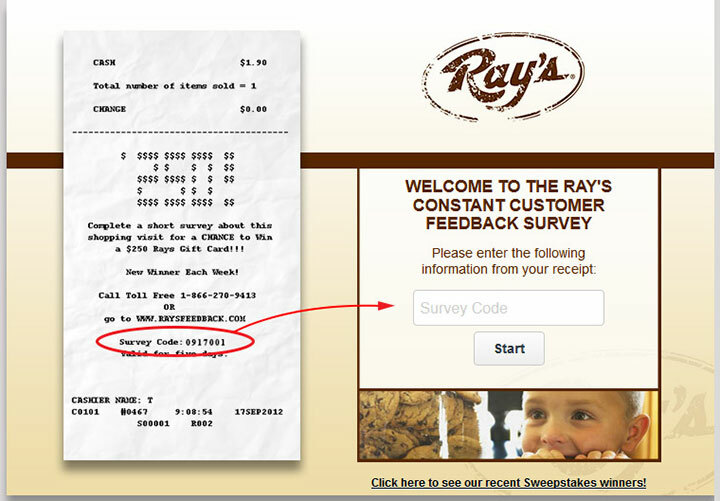 The Ray’s Constant Customer Feedback Survey, found at www.Raysfeedback.com, is an online questionnaire designed by Ray’s to help improve customer satisfaction. You will get a chance to win a $250 gift card to Ray’s as well. Ray’s Food Place is a store offering a wide range of grocery items – with the line comprising high-quality, fresh-cut meats, bulk foods, fresh produce, and several organic options. There is also a bakery that offers a broad assortment of muffins, cakes, and fresh-baked breads. Moreover, Ray’s deli offers some other ready-to-eat food items. Functioning under the aegis of C&K Market, Inc., Ray’s Food Place offers multiple varieties of international, regional and local wines, along with a large microbrew selection from the northwest. Despite all the variety on offer, Ray’s Food Place is more famous for its fresh products, friendly staff and great customer service. Have your recent Ray’s receipt that contains an invitation for the survey. Enter your survey code from your receipt. This should be seven digits. Click start when ready. Answer questions. These questions will rate your experience. You will be asked about the store associates, the cleanliness of the store, whether you found everything you wanted, if you bought items you weren’t planning on it and whether or not you used sales or coupons. You will also be asked about other things. Please read through the directions at the top of each page and read through the question carefully before answering. If you had a problem, you may also be asked to explain further. In some cases, based on the answer you provide, you will be asked why you gave that answer through a text box. You can type in whatever you want to answer the question. Enter the drawing. You will need to include your name, email address and telephone number, along with your home address. Not all the information will be required. If there is no asterisk, you do not have to include that information. You may also be asked if you want to join their newsletter. You are not required to enter the drawing or join a newsletter, if you do not want to do so.